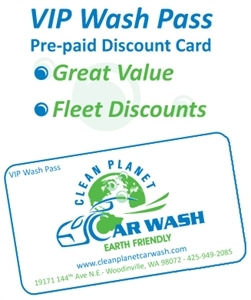 Clean Planet Car Wash VIP Wash Passes are pre-paid discount cards or codes for our frequent visitors. VIP Wash Passes can be purchased in any amount over $25.00 and make a GREAT GIFT! In the checkout process, please select whether you would like your VIP Wash Pass card to be mailed to you or if you prefer to have a code emailed to you directly.